To truly understand why so many people are angry at Marco Rubio about his Gang-of-Eight amnesty bill, you have to go all the way back to his race against Charlie Crist. Rubio was a Jeb Bush acolyte who embraced the Tea Party and ran for senator in Florida against Charlie Crist. Crist was the popular sitting governor in the state and Rubio was thought to be a huge underdog. However, the grassroots embraced Rubio. Just to give you an example, very early on I organized a coalition that endorsed Rubio and encouraged people not to give money to the NRSC over its endorsement of Crist. I even called for NRSC chairman John Cornyn to RESIGN over his decision to get involved in the race on Crist’s behalf. I am strongly against amnesty. The most important thing we need to do is enforce our existing laws. We have existing immigration laws that are not being adequately enforced. Nothing will make it harder to enforce the existing laws, if you reward people who broke them. It demoralizes people who are going through the legal process, it’s a very clear signal of why go through the legal process, if you can accomplish the same thing if you go through the illegal process. And number two, it demoralizes the people enforcing the laws. I am not, and I will never support any effort to grant blanket legalization/amnesty to folks who have entered, stayed in this country illegally. Unfortunately, even though Marco Rubio is only in the Senate today because he claimed to be in favor of securing the border and stopping amnesty, his position shifted 180 degrees and he became the front man for the Gang-of-Eight amnesty bill. In a competitive primary, people understandably tend to take what pundits say about candidates with a grain of sand; so instead of my telling you how unimaginably bad this bill was, let me show you what other people said about the bill back in 2013. Now, I can’t quite agree with Rush there. Marco Rubio’s Gang-of-Eight bill wouldn’t have wiped out the Republican Party; it would have just insured that no Republican to the Right of Arlen Specter would ever be elected as President again after it demographically flooded conservatism out of existence in America. Getting beyond the Gang-of-Eight bill, as late as June of this year, Marco Rubio was openly saying that he wanted to make illegal aliens citizens. However, today he tries to muddy the waters about the subject by merely saying he thinks illegal aliens should eventually be able to get green cards. Of course, people who have green cards are allowed to apply for citizenship; so it’s the same difference over the long haul. The funny thing about that is it’s very similar to what John McCain said back in 2008 when, like Rubio, he was running for President after his comprehensive immigration bill failed. As the recent immigration debate demonstrated, Americans have little trust that their government will honor a pledge to do the things necessary to make our border secure. As president, I will honor that pledge by securing the border, thus strengthening our national security. …Once we achieve border security, we must ensure that we approach our remaining immigration challenges with constructive dialogue and solutions that reflect a compassionate approach and the needs of our economy. Of course, that’s what “straight talk” John McCain said when he was trying to win an election. However, when the Gang-of-Eight bill rolled around, the Republicans involved were Jeff Flake, Lindsey Graham, Marco Rubio AND John McCain. Furthermore, you cannot forget that many of Rubio’s establishment backers are behind him specifically because they are expecting him to break his word again and back an immigration plan similar to the Gang-of-Eight bill. That’s all worth keeping in mind because Marco Rubio wants to be President and he’s promising to get tough on illegal immigration. If he’s telling the truth, he might be a decent candidate. If Rubio’s lying, it doesn’t really make much of a difference over the long haul whether you elect him or Hillary because his immigration policies would permanently cement liberals in power without securing the border or doing anything of significance to stop illegal immigration. 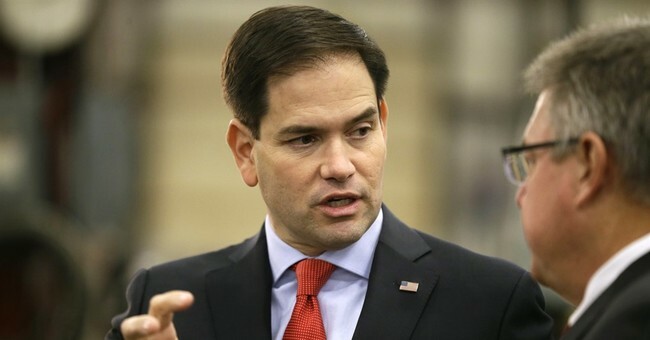 Put another way, if Marco Rubio becomes the President of the United States, the future of our republic depends on Rubio telling the truth this time after he already lied about the same thing to people who walked over broken glass to get him elected. So now, are you ready to walk over broken glass to get Marco Rubio elected? Choose wisely because if Rubio becomes President and he’s lying about immigration again, it will be the end of the road for conservatism in America.